We love both Robots and Gardens. One of our goals has always been to have a demonstration garden, managed as much as possible by robots (automation). We started working on this at our original location on Longard Rd. in Livermore but have a lot more opportunities to do great things in our new location. As phase 1 of the Aquaponics Interest Group, we are putting together an aquaculture system. We are raising funds to move the aquaponics project forward. Any donation is appreciated. If you could like to participate in building an aquaponics system and learning hands on, please donate. Raspberry Pi connected to WiFi posting data to and accepting commands from server backend (Phant?). This is the most significant chemical cycle in an aquaponics system so for the health of our fish and plants we need to monitor it. Fish tank – basically an IBC tote with the top cut off. 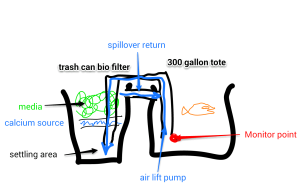 Water circulation and aeration accomplished by means of an airlift system (see http://www.koiphen.com/forums/showthread.php?129885-types-of-air-lifts). The great benefit of this system is there is no need for a mechanical pump to move water. Fish. We only have four little fish in there now (two goldfish and two catfish). The biofilter is fully ‘cycled’ now so we can accommodate more fish but we’re holding off until we have monitoring systems in place. Build and install a remote monitoring and control system. We have a Raspberry Pi and OpenSprinkler Pi relay board as well as temperature and other sensors. Please donate if you would like to see this happen.